Patek Philippe often pairs platinum cases with diamond settings, especially on its grand complications, the newest of which is the Ref. 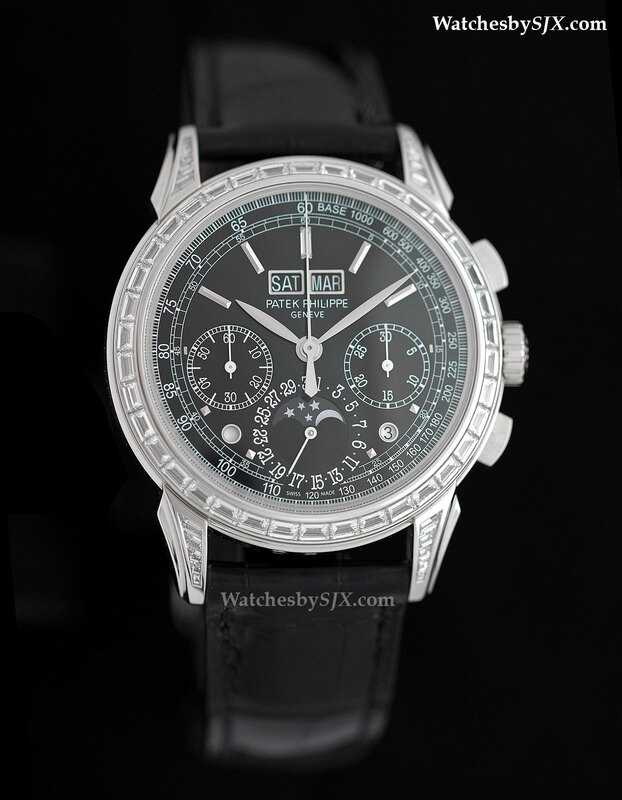 5271P, a platinum chronograph with perpetual calendar set with nearly five carats of baguette diamonds. 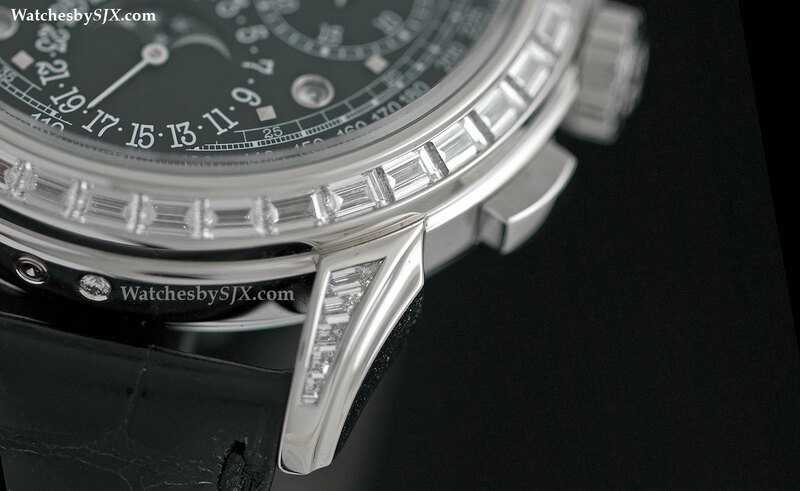 Historically Patek Philippe has often paired its platinum timepieces with diamonds, usually with black dials. The models available in this glittery decor range from basic Calatrava watches to top of the line grand complications. 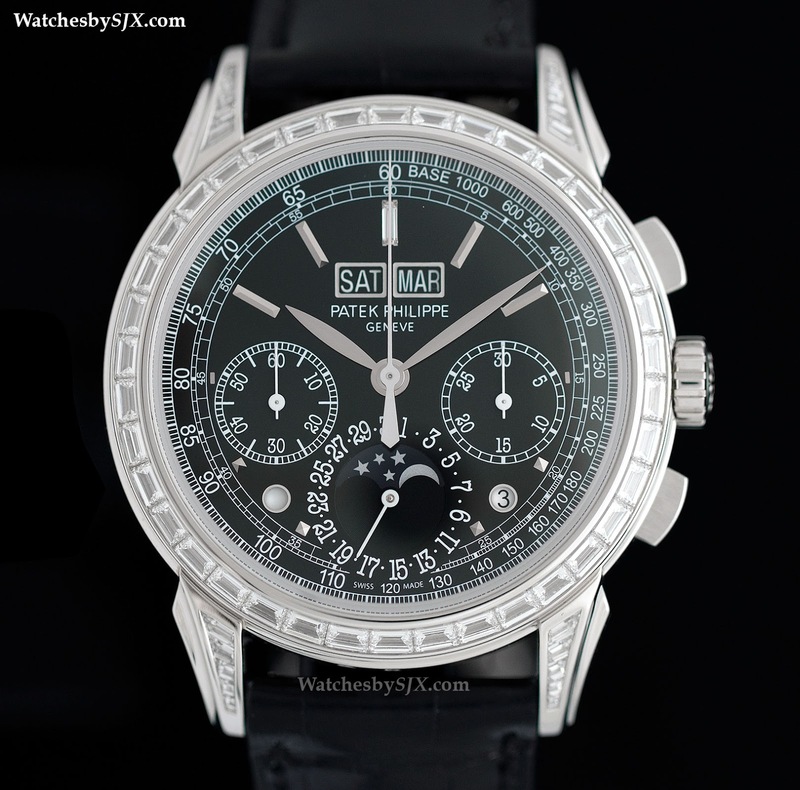 One of the most impressive is the platinum perpetual calendar chronograph with diamonds, part of the collection since the eighties with the Ref. 3970. 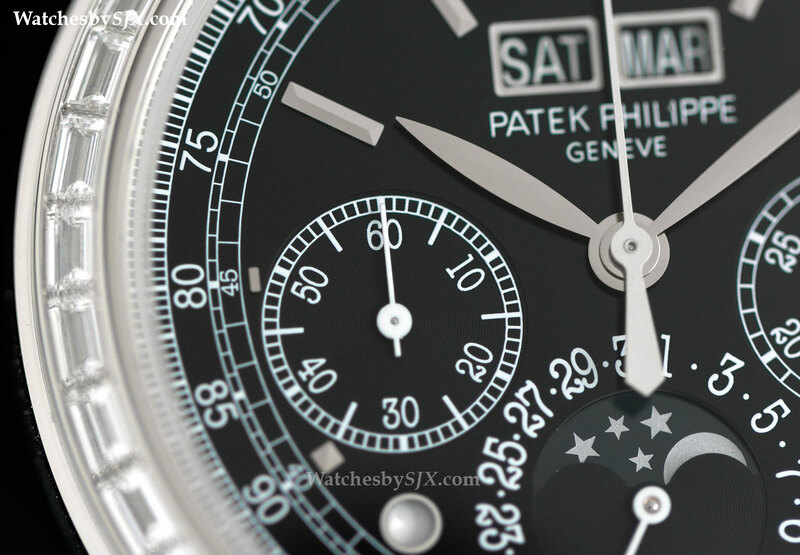 The latest, and possibly greatest, iteration of this chronograph (Patek Philippe has a remarkable history in fine chronograph wristwatches) is the Ref. 5271P, a flashy and impressive watch without being coarse or louche. The platinum case is set with 58 baguette diamonds on the bezel and lugs, with another 22 baguette diamonds on the folding clasp, totalling about 4.6 carats. And the dial is black, as is tradition with this model. Despite being in the collection for only three years, the Ref. 5270 (the basic version of the Ref. 5271) has undergone several iterations in its dial, starting with the original, somewhat plain railway track dial to the newest and much derided tachymeter dial with a bulge at six o’clock. The Ref. 5271P combines the best of the other dials. 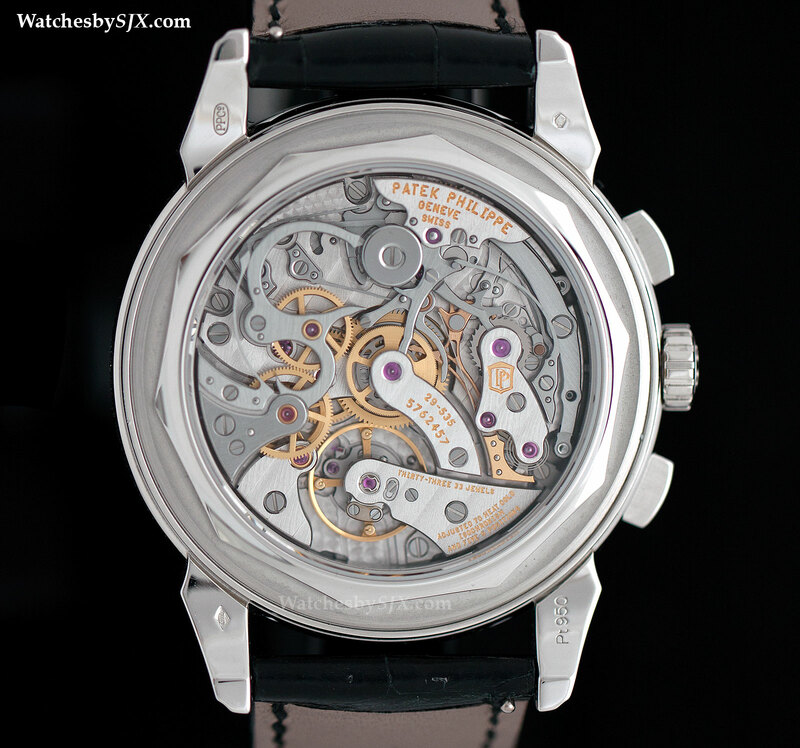 It has a tachymeter, railway track for the minutes, and no “chin” at six o’clock. 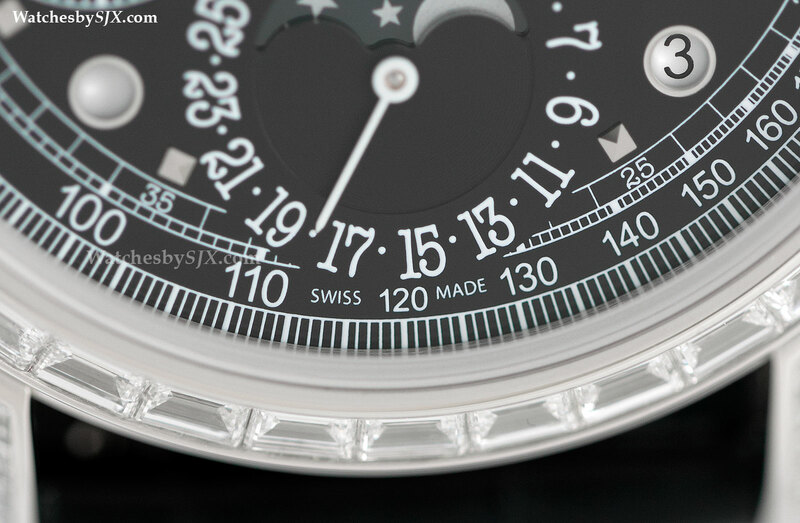 Of all the dials used on the current generation perpetual calendar chronograph, this is the layout that is most coherent and similar to those on the equivalent vintage models. Instead of the conventional bright blue the moon phase disc is a dark blue, almost grey. The whole watch has a monochromatic look, which goes well with the brilliants on the bezel and case. Particularly elegant, and usually overlooked, are the lugs on the Ref. 5271 (and Ref. 5270 which shares the same case). The lugs are long and sleek, with a pronounced concave step along their length. Compared to the previous generations of this model, the Ref. 5271 has a noticeable more complex and detailed case. 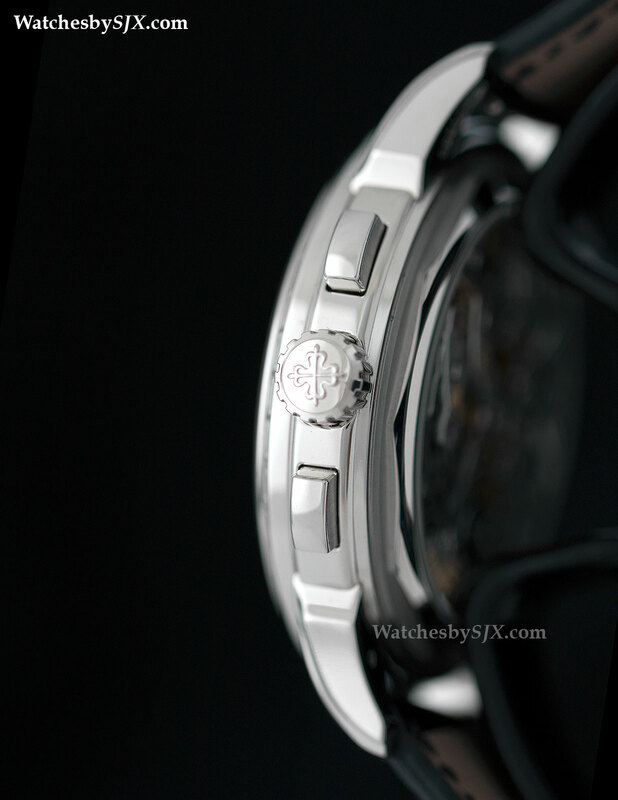 But the front of the watch is mostly lavish ostentation, the rear is where the finer details can be found. 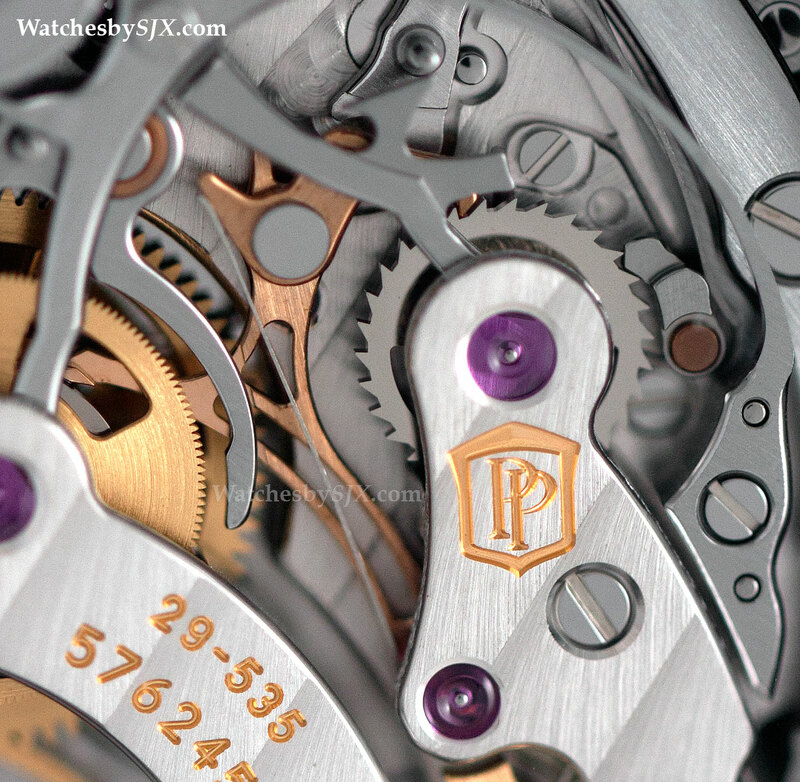 The movement inside is the CH 29-535 PS Q, the first in-house perpetual calendar-chronograph movement developed by Patek Philippe. Beautifully decorated and cleverly constructed, it is a sight to behold. However, one criticism of the aesthetics is that the bridges have far too many rounded and soft corners, rather than the sharp, inward corners that are traditionally a hallmark of fine hand-finishing. That being said, relative to the rest of contemporary chronographs, this is as good as it gets, and then some. 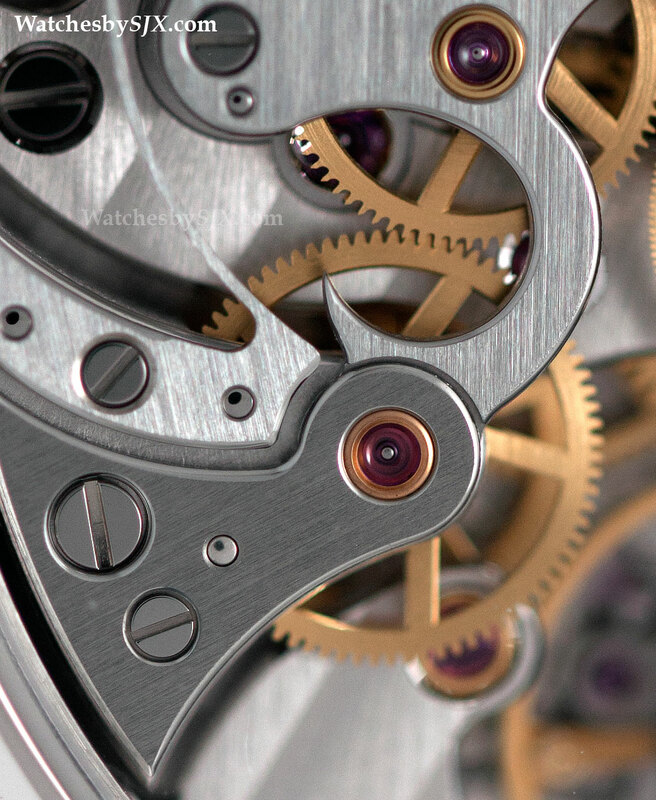 Two particularly attractive components are the S-shaped clutch lever at left, and the polished steel cap over the column wheel, a traditional feature of high-end chronographs from Geneva watchmakers. 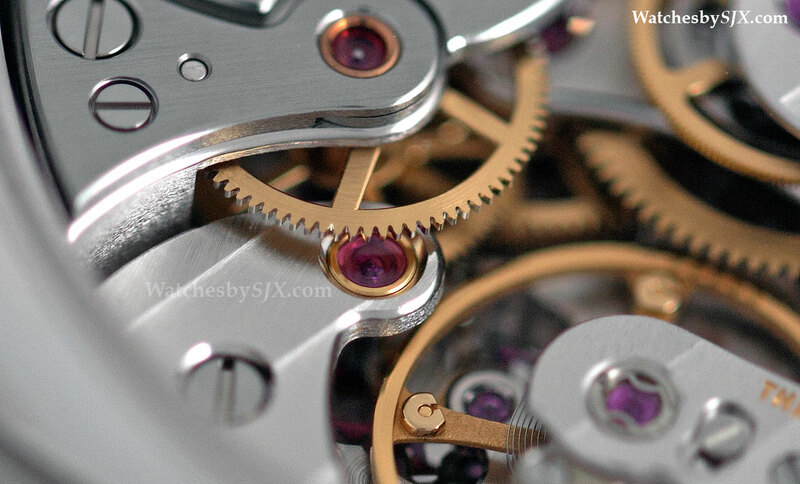 Manually wound with a chronograph mechanism typical of classic high-end chronographs – namely a column wheel and horizontal coupling – the CH 29 movement nonetheless is equipped with several notable technical features. Interestingly the column wheel cap is not just for tradition and aesthetics. 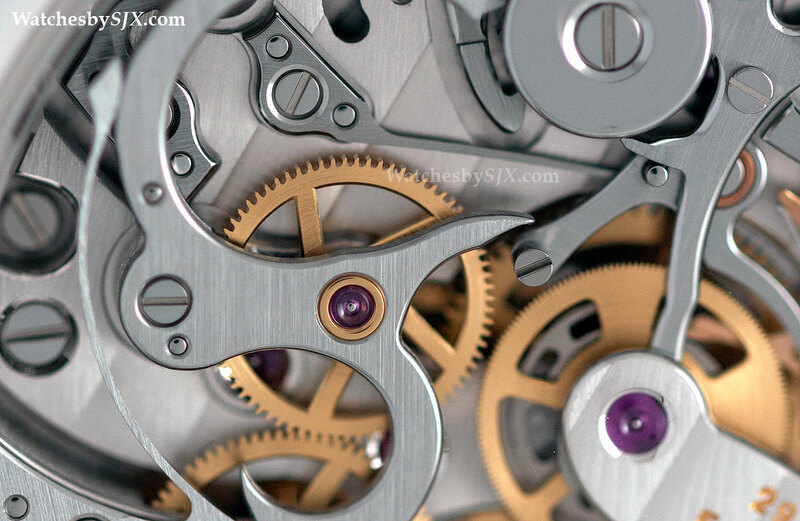 While in the past the cap was used to keep the chronograph levers in place when shocked, the cap in the CH 29 is used to adjust the meshing of the chronograph wheels. 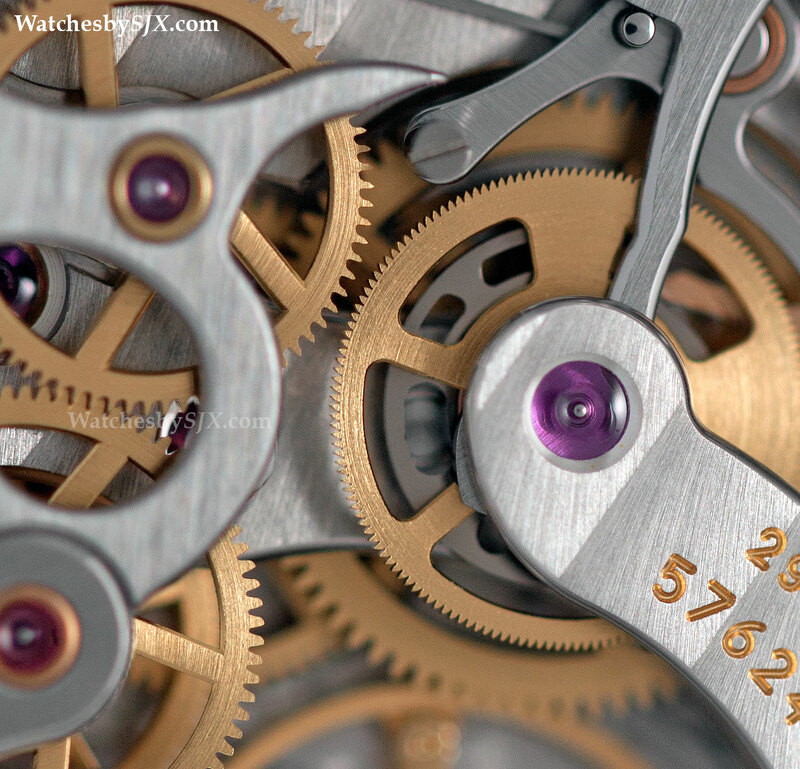 Another impressive detail is the patented tooth profile of the gears in the chronograph mechanism. Designed to eliminate the annoying and common jump in the hand when starting or stopping the chronograph, as well as improve efficiency, the teeth are ever so slightly inclined in one direction (conventional teeth are basically aligned straight). 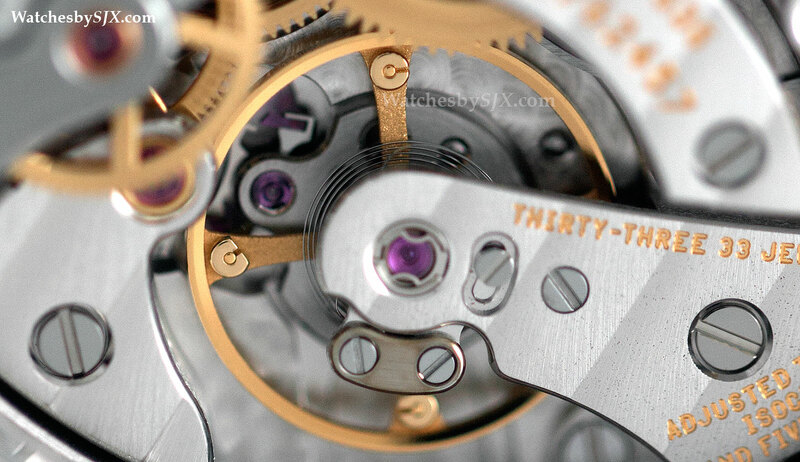 The CH 29 also features an instantaneously jumping minute counter – the elapsed minute hand crisply jumps at the exact moment the central seconds hand passes 12. Most chronographs have a dragging minute counter, easier to execute but less precise. 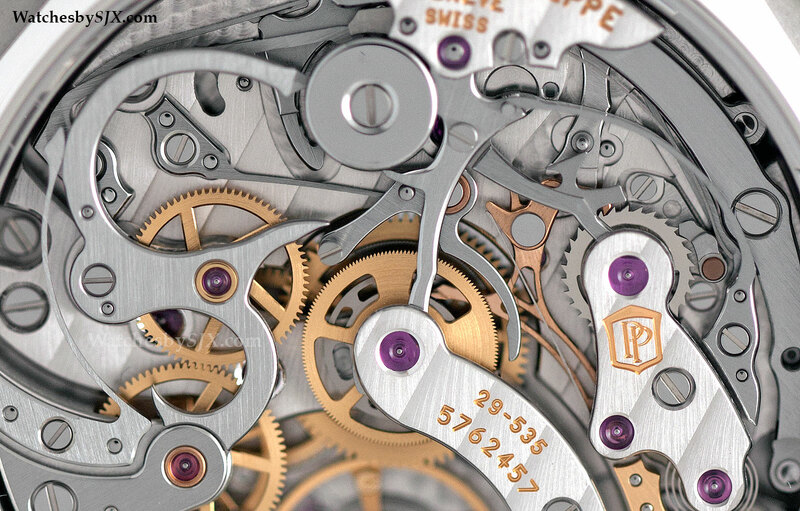 This feature is most commonly found in vintage pocket watch chronographs; Lange was the first to implement it in a wristwatch with the Datograph of 1999. Most jumping minute counters, including that of the Datograph, use a snail cam and lever for the jump. That’s the traditional solution but causes drag on the movement. 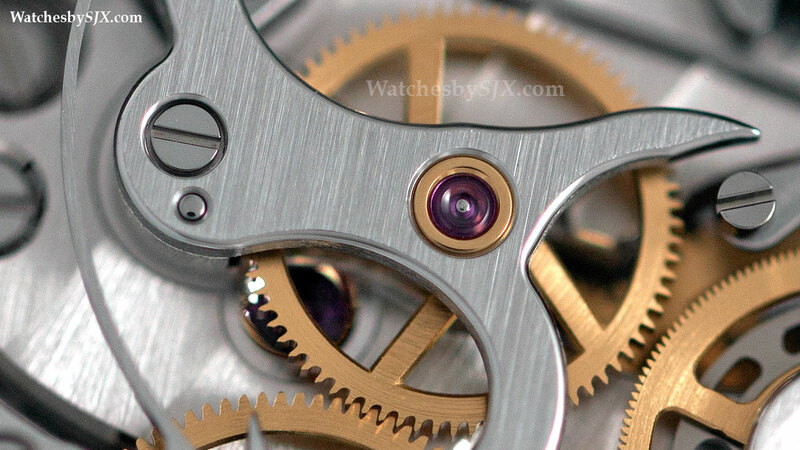 In the CH 29 the jumping minutes is controlled by a gear with serrated teeth, linked to a thin spring and a coiled spiral. And the oscillator is the classic proprietary Gyromax balance, a four-spoke, free-sprung balance with adjustable weights. The Ref. 5271P is an impressive timepiece inside and out; the CH 29 movement inside is arguably the most sophisticated, high-end chronograph movement. 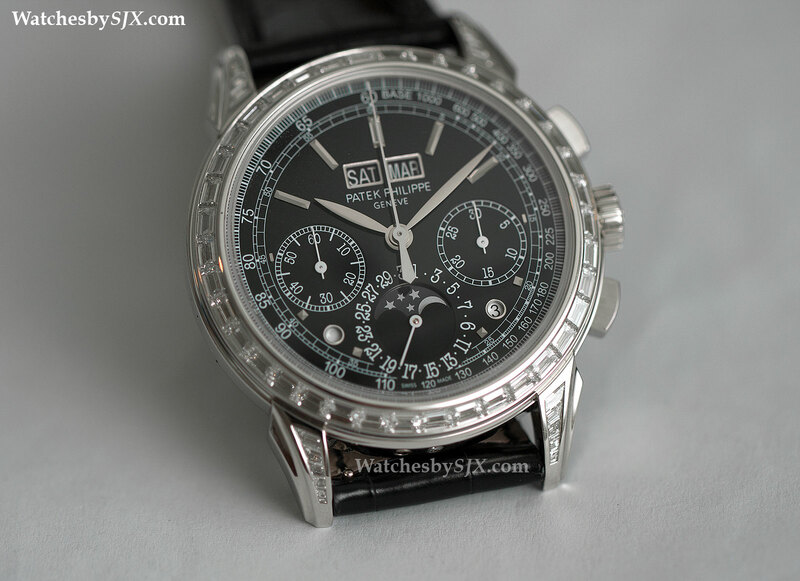 But like all Patek Philippe watches it has an mighty stiff price tag that’s superior to all the competition. The Ref. 5271P retails for 345,000 Singapore dollars or US$280,200.